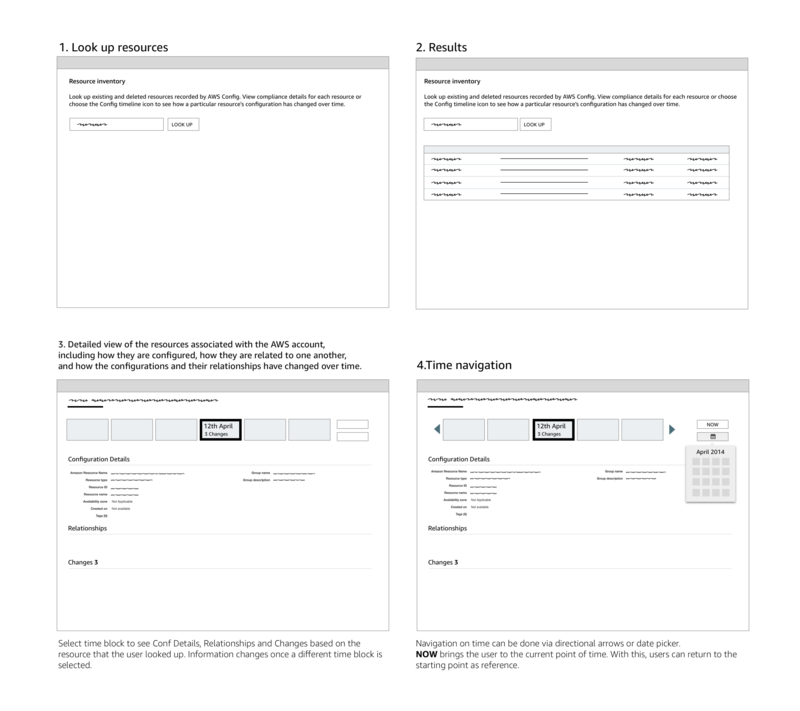 Task: Design a new AWS Console that provides a detailed view of the resources associated with a AWS account, including how they are configured, how they are related to one another, and how the configurations and their relationships have changed over time. In 2014, there was not a way to access full history of changes to AWS customers resources and relationships over time. Understand customer's context and needs. Show the experience from the customers' perspective. Time - interaction starts when the customer start having difficulties keeping track of and localizing resources changes over time when using AWS. Need - Enable to simplify compliance auditing, security analysis, change management, and operational troubleshooting. C. Display number of changes. D. List of Relationships between resources. E. Data visualization. F. Look up feature. Select "time" shows detail information of the resources (Panel). Datepicker for selecting a particular date. Home button to return to the current day. To measure how successful our feature is in measuring customer engagement. Number of users per session.